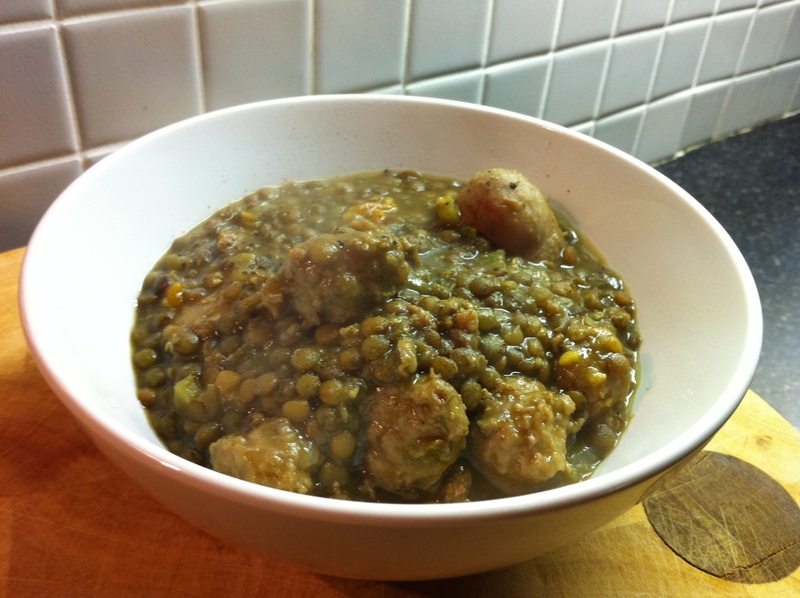 So here’s the first of my recipes – a variation of the Italian class Salsiccia e Lenticchie, otherwise known as Sausage and lentils. The first thing to say about this is that it tastes much better than it looks! 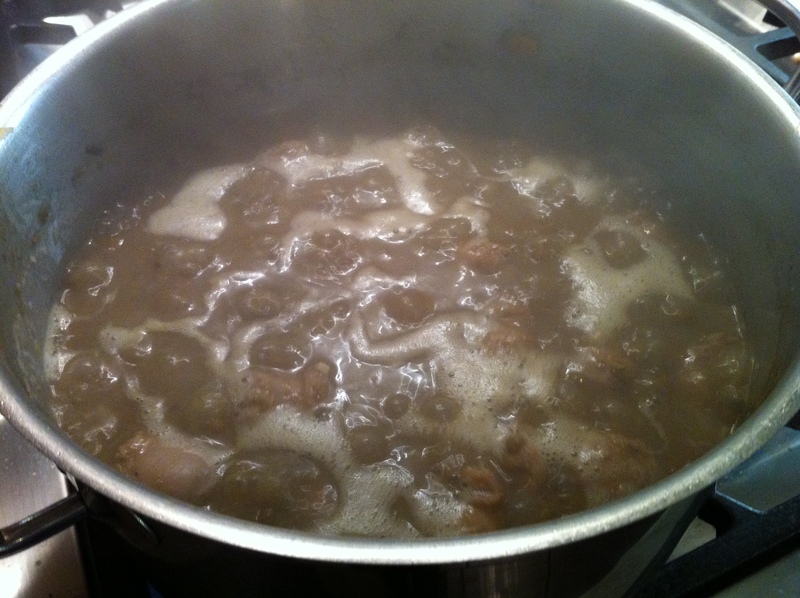 This is a recipe that is traditionally served on New Year’s Eve at midnight as the New Year is rung in. I first had it in Rome on New Year’s Eve in maybe 2002 or 2003. Can’t quite remember now, but that’s not important. Myself and my wife enjoyed a nine or ten course meal in a low key restaurant, complete with wines and champagne. At the end of the night, as the count down to midnight was sounded around Trastevere, and long after desert was served, the kitchen produced steaming bowls of Salsiccia e Lenticchie. This recipe is my adaption for the original. It’s pretty authentic, but the big differentiator will be the quality of sausage you use, whether it’s Italian or not – I don’t think it matters massively as long as they are good quality properly made sausages. 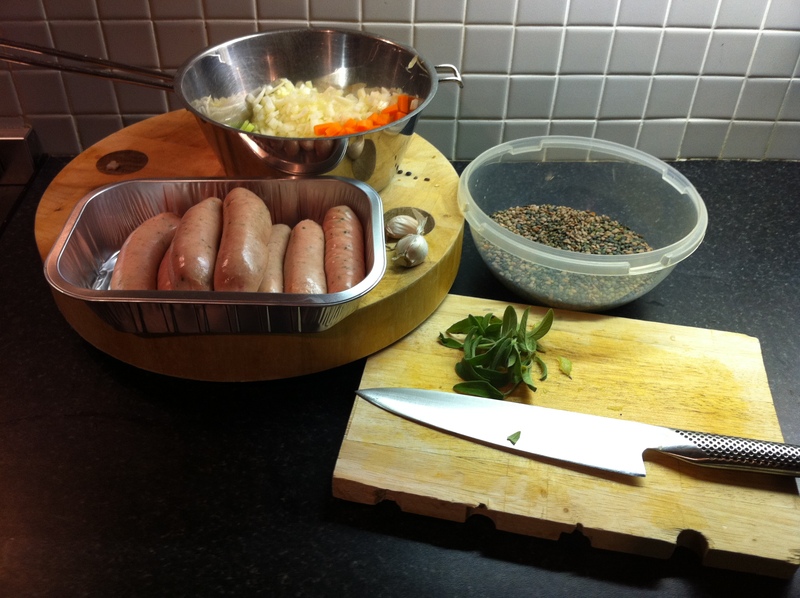 The dish will be as good as the sausages you use. It’s well worth a try- it’s one of those recipes that’s extremely simple and yet tastes absolutely amazing. It doesn’t look terribly pretty in the bowl, but you have to taste it to get it. It’s cheap as chips and makes a great mid-week treat. Enjoy! I don’t have measurements for this, as I don’t use any. You sort of have to judge quanities as you go. Above, you can see all the ingredients laid out. I use a basic Italian soffrito, or equal parts celery, onion and carrot diced relatively finely. 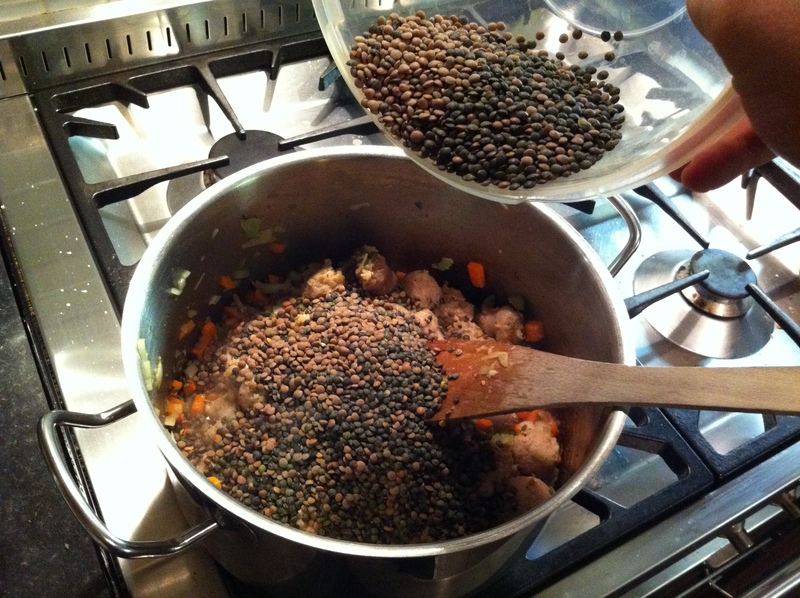 In addition, I use garlic, sage, pork and leek sausages, and finally equal parts brown and puy lentils. 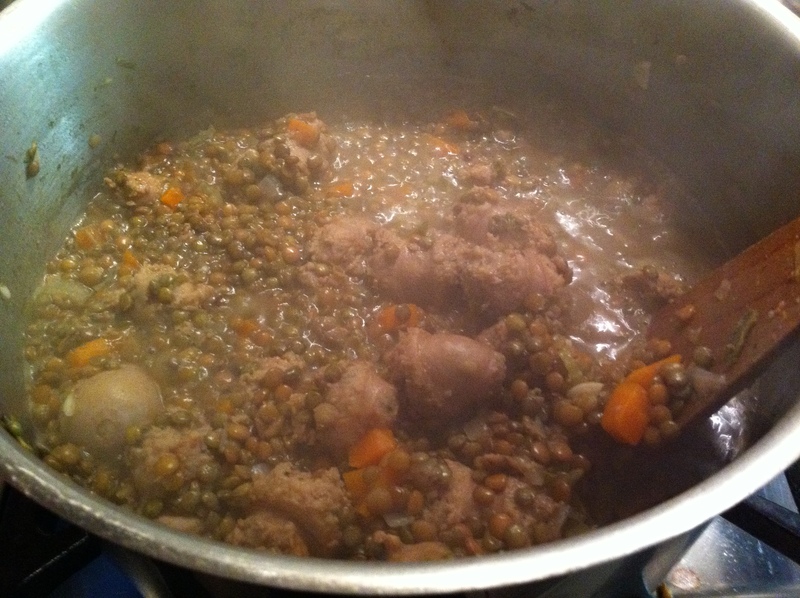 I’ve mentioned the importance of the quality of the sausages, so now a word on lentils. Some lentils require pre-soaking but neither puy nor brown lentils do, so you can make this straight away, pretty much from store cupboard ingredients. Brown lentils cook right down to give a lovely gravy-like, thickened consistency to the finished dish but puy lentils retain their shape as they’re cooked so that’s why I’m combining them. With both kinds of lentils, it’s really important to sort through them to try to find any small stones – I’ve nearly chipped my teeth in the past, but it’s just part of the peril of using a natural ingredient. It’s a pain, but you have to do it. Should only take five minutes really. We’ll start with the sausages. You don’t have to fry them first, but it does give them better colour and flavour, so start by adding some decent quality extra virgin olive oil to a good sized pot and then add your finely chopped sage leaves. Leave these to sizzle and crackle for two or three seconds while you chop your sausages into chunks and then add them to the pot. They’ll cook out properly later on, so now you just want to give them some colour. After a minute or two, add your garlic – you don’t want it to burn but you do want to flavour the oil the sausages and sage are in. 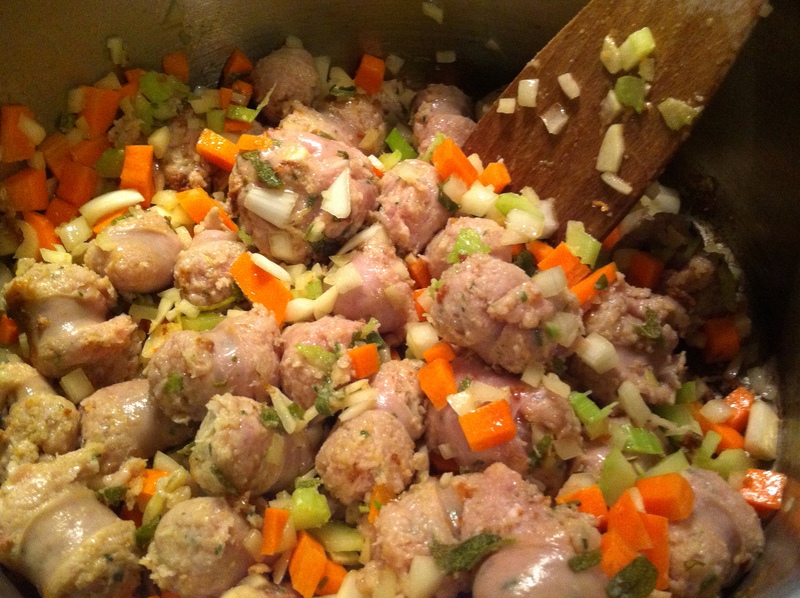 Toss the sausage chunks in the flavoured oil and don’t worry too much if it starts to stick. It’s fine as long as it doesn’t burn so you just need to keep the mixture moving. I use a classic soffrito to make the flavour base for this dish, so next, I add carrot, celery and onion to the pot and give it a good mix around. 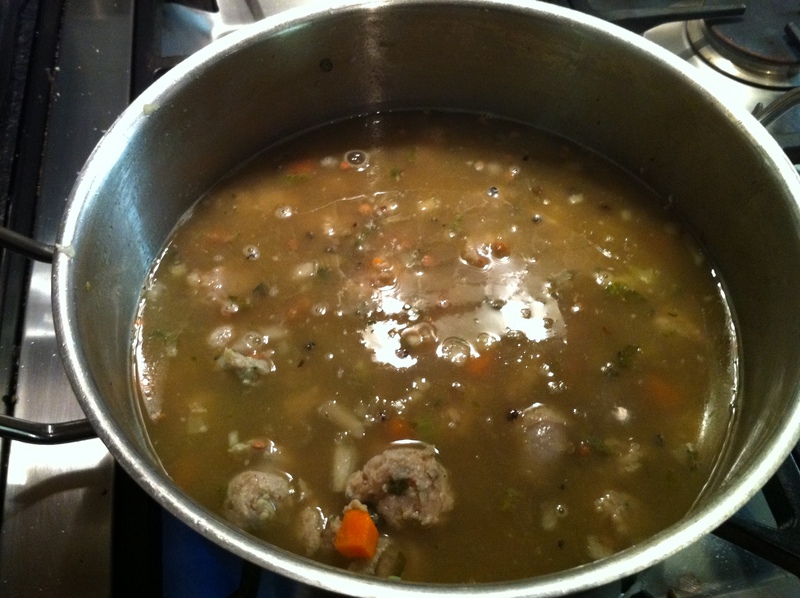 Next, add some neat stock – I use Knorr vegetable stock pots – and then then your lentils. Mix this thoroughly to combine all the flavours with the undiluted stock. All you need to do now is bring this up to a simmer and cook it for around 40 minutes. Keep an eye on it to make sure it doesn’t cook dry. If it gets too thick, just add more water and give it a good stir. You’re looking for a finished consistency which is a bit like a risotto in texture. Be careful to taste the liquid before you season it during cooking – some stocks are very salty and some sausages are also quite salty – it’s easy to ruin it by adding seasoning without tasting it first. To finish, dress with some good quality extra virgin olive oil, some Maldon salt and and several twists of fresh cracked black pepper.